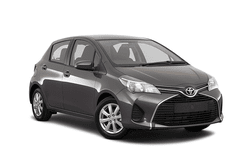 Fuel efficiency, power, control, and comfort are all waiting for you in your next car rental when you choose the Toyota Yaris. This model is sleek and stylish while also offering great control and speed with a powerful engine that fits into a small yet charming package. The vehicle is made to handle well in any weather conditions and is a great way to get out and see the sights or get to wherever it is you need to go. With an impressive 5 door and 5 seat configuration the Toyota Yaris has room for all your passengers and all your cargo! Travel in style and see what all the fuss is about for yourself and drive away in a Yaris today and enjoy the road like never before!